Upon your arrival at the Airport in Kuala Lumpur, meet our representative awaiting just outside the arrival hall, past the customs area & currency shops. You will be escorted to the hotel booked for your stay. 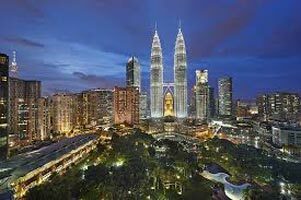 Kuala Lumpur is the Asian cyber-city; with historic temples and mosques stand adjacent to space-age towers and shopping malls. The day will be left free for leisure. Overnight at hotel. After breakfast drive back to Kuala Lumpur and depart for a 3 hours city tour. The tour starts passing through the busy city center and witness the longest painting in the world on the walls of the Pudu Jail and cruise along Independence Square before driving through Chinatown. Visit the oldest mosque in Kuala Lumpur-Masjid Jamek and also see the Tugu Negara or War Memorial built to commemorate those who perished in the war which is inside Lake Garden. The drive next will take you along the Moorish-styled Federal Court, the Railway station which is a masterpiece of Mohammedan architecture and the Kings Palace. 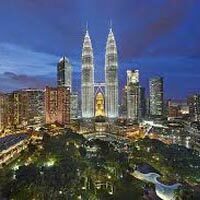 Rest of the day brings a shopping spree before you return to your hotel in Kuala Lumpur for night stay. After breakfast you will be transfer to to enjoy a splendid view of the islands from the mountain peak where it is situated. The City of Entertainment as it is popularly known Genting Highlands will bedazzle you with its exotic nightlife, its opulent bars, glitzy casinos and clubs and exhilarating theme parks and its lip-smacking cuisines. Enjoy full day visit to outdoor theme park of Genting Highlands. A day full of excitement and frolic will end in evening when you will be directed back to the hotel for night stay. After breakfast, you have a day free at leisure in Genting. Later, proceed to Kuala Lumpur to board your overnight train to Singapore. Welcome to the Lion City! On arrival in the cheerful ambiance of Singapore you will be transferred to your chosen hotel. You may start-off with a bit of shopping spree in Singapore and then later you can choose to opt for Night Safari later. Night Safari: Embark on world's premier night zoo. The tour takes you to a remarkable 40-hectare jungle reserve where over 1200 nocturnal animals may be seen. Roam the jungle in the complete safety of your TRAM which takes you through the East and West Loop weaving through selected habitats designed specifically to replicate the natural environment from the Himalayan Foothills to the Southeast Asian Rainforest and Indian Subcontinent. On completion of the tram ride, your tour guide will lead you on a walking trail where you will be able to view some animals at closer quarters. Begin the day with a refreshing breakfast which will be followed by a panoramic half-day tour of the city. The city tour begins with a drive through the 'Colonial Heart' to get a glimpse of the Padang Cricket Club which is surrounded by several important landmarks such as Parliament House, Supreme Court and City Hall, and more. Next pay homage to most important Fukien or, Thian Hock Keng Temple; the temple is also the oldest temple in Singapore. Also visit Merlion Park to enjoy gorgeous views of Marina Bay. Later proceed towards National Orchid Garden, local handicraft center and Little India.